Here’s a look at a design project I’m working on. This is a driver circuit for a push-pull amplifier designed around the 6KV8 tube. The 6KV8 tube is a high-gain triode with good linearity and high transconductance coupled with a frame-grid pentode also having a high transconductance. Tubes like this were designed for television applications, not audio. Here the triode sections of the two 6KV8s are connected as an active-loaded gain stage, which then feeds the two pentode sections acting together as a phase inverter and driver section. The pentodes use IXYS programmable current sources to help linearize their operation. The circuit includes local power supply filtering and the negative bias supply. There are two options for feedback loops. One loop goes to the cathode of the lower pentode, and makes a standard feedback loop. The other is plate-to-plate loops from the output stage via connections LF1 and LF2. These are both subject to some experimentation when the prototype PCBs arrive and are stuffed. 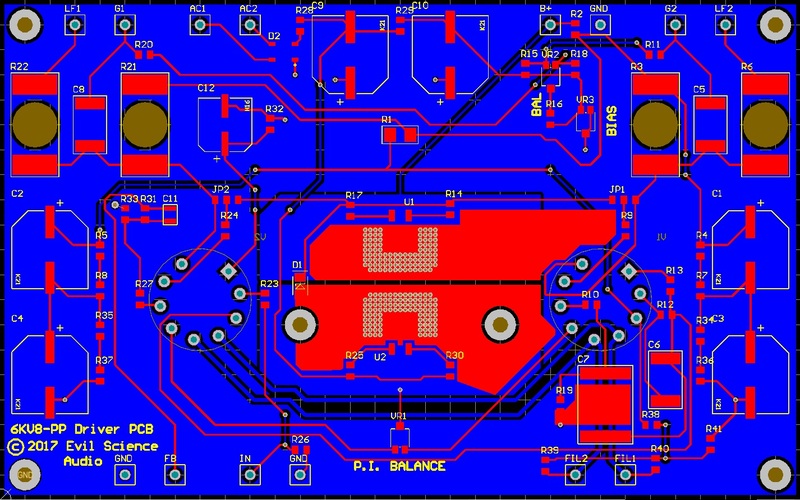 This is the art of the PCB itself. 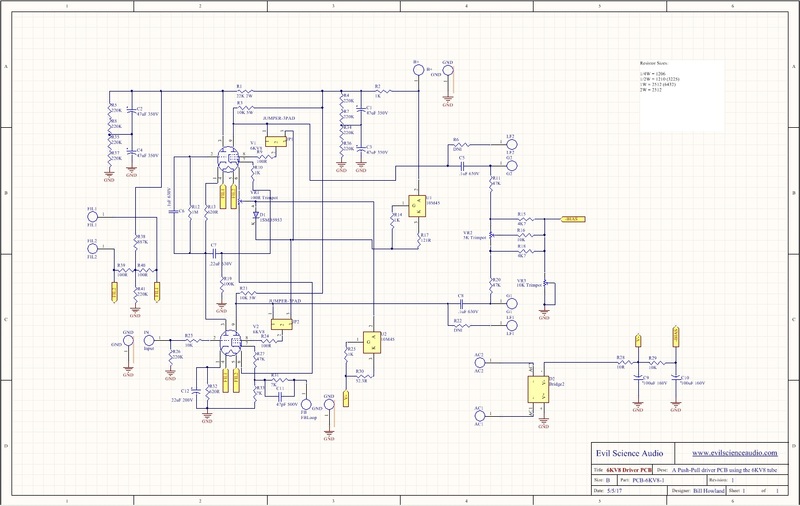 This is where my project is different from what you’ll usually see in PCBs for vacuum tube audio. Other than the tube sockets, all components are surface mount. This is the more modern assembly method for electronics. The possible disadvantages are how the PCB will handle waste heat, and the limits on component selection. You can see in red the large copper area used as a heat sink for the current source components, which if effective will eliminate the use of a standard aluminum heat sink. More to come when the prototype is ready to test!